Today we learned at the top of the news that Harry “Crafty” Reid pulled the nuclear option on his Republican colleagues in the Senate, to vote on President Obama’s nominees to the DC circuit court without an obstructionist filibuster from the opposition. Forgive my contrarian streak, but I don’t see why the Republicans don’t celebrate, if not gleefully, then soberly and with hope, on this one. Repubicans made Harry Reid so mad, they goaded him into forever ending the Democrats’ ability to block Republican nominees in the future. The Republicans have a good chance of winning the Senate in the next two election years, 2014 and 2016. Neither party ever has the White House locked in, especially when an incumbent is not running. Ending the filibuster rule gives each party the opportunity to have its way with fifty-one votes. Who wouldn’t want that? Now that the dam has broken, the Republicans should push to remove the filibuster rule for all votes, not just confirmation of judicial nominees. You caved on the issue of judicial nominees, Republicans might say to the majority leader. Now let’s see you be consistent, and overthrow this fusty tradition for every vote. I wonder how Senator Reid would respond to that? He may decide he likes the filibuster better than he thought. Senate Majority Leader Harry Reid. You expect senators, of all politicians, to have a longer view. They tend to hold elected office longer than anyone else in government. Yet they want to maintain voting rules that make their own institution ineffective, no matter which party has the majority. No opposition party will be in the minority for all that long, so even with a short term view, a reasonable legislator would favor simple majority votes. The filibuster survived as a Senate tradition for so long because, for most of its history, senators used it with discretion. They used it to dramatize extra important issues, and the senator who launched the filibuster would actually hold the floor for some ungodly amount of time. No bathroom breaks, and therefore water by the thimbleful. When Rand Paul and Ted Cruz mounted their marathon speaking engagements from the Senate floor, people paid attention. The drama’s inescapable when a skilled orator stands on principle. Rand Paul speaks from the Senate floor to oppose the nomination of John Brennan to head the CIA. Far from a dramatic gesture, the filibuster has degenerated into a mere threat, effective and strangely inconsequential at the same time. Senators don’t even have to hold the floor anymore. Rather, they invoke floor rules to signal their intention to filibuster, and thereby block a vote. You could almost call it paralysis by mutual agreement, or mutual assured destruction to use another nuclear metaphor. Why bother with a twenty-four hour or a twelve-hour speech when the parliamentarians permit senators to block a vote without all that trouble? Then Crafty Reid decides he won’t let the obstructionists have their way with the DC circuit court nominees after all. He changes the rules, by a simple majority vote, to bring Obama’s judicial nominees to the floor for a confirmation vote. That supposedly makes the Republicans angry: they have resisted the so-called nuclear option before, and the Democrats backed off. This time the Democrats went ahead and exploded their Fat Boy. 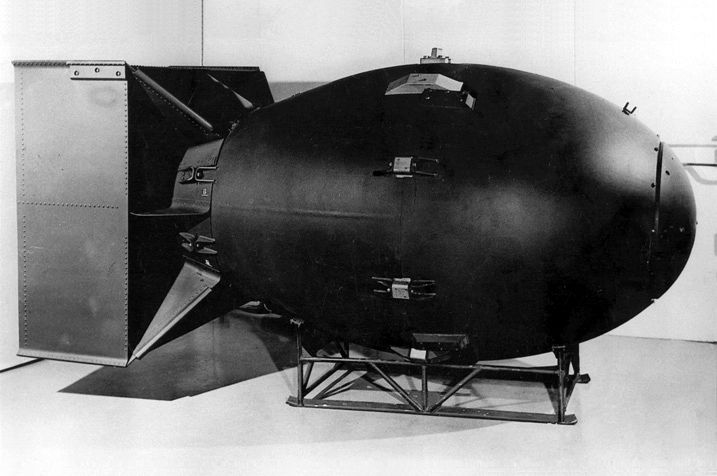 When journalists talk about the nuclear option, I wonder where phrases like that originate. Do the senators themselves think of it that way? The only rational legislator who would support the filibuster rule is one who expects to remain in the minority forever, a backbencher in perpetuity. You preserve the power to obstruct because you never expect to have power to enact. You play perpetual defense because you never expect to have the ball. I suppose Harry Reid could find a way to require fifty-one votes for passage when the Democrats are in power, and sixty votes for Republicans when they have the majority. I have no idea how he would do that, but I bet some Republicans distrust him so much, they think he would find a way to get away with it. If you distrust the majority leader that much, you have another reason to keep the filibuster rule. The last reason for maintaining the rule is to say we’ve always done it this way. That’s the traditionalist’s argument. It’s not part of the tradition, however, to use the threat of a filibuster indiscriminately, to block virtually every action the Senate might take. Both Democrats and Republicans have participated in this innovation. Both Democrats and Republicans have suffered because forty-one votes could block what they wanted to do. Both Democrats and Republicans have complained about partisan gridlock, pretending they have no power to change their own rules. 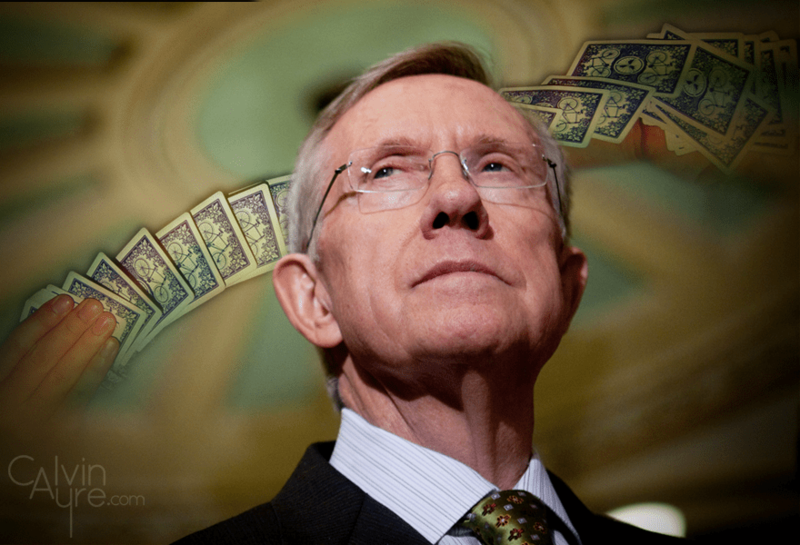 Harry Reid just proved that the Senate can change its rules. 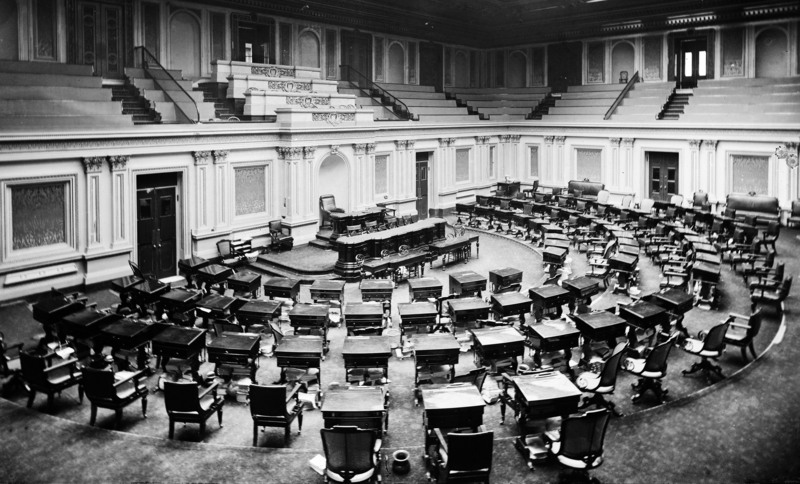 The United States Senate chamber circa 1873. As a closing thought, think of the extra motivation for each party’s national campaign committee if fifty-one votes were enough to enact your party’s program. Each party has virtually no chance to reach sixty seats in any election, but a realistic chance of reaching fifty-one. A new day would open for both parties, in fund raising and statewide get-out-the-vote efforts, if Senate races mattered more. Because the Senate has paralyzed itself with fake filibusters, it doesn’t even matter that much who has the majority anymore. Holding the majority would matter a lot more if fifty-one votes took your party across the threshold of efficacy. We know that this self-imposed paralysis, attributed simply to partisanship or obstructionism, is a matter of discouragement for the senators who live with it. We can see that in the number of retirements from the Senate, where departing legislators all cite the same reason for leaving. People who leave the Senate, one after the other, all say that the upper house is far less collegial and much more partisan than it use to be. The inability to do anything leads senators to ask, “What am I doing here?” Individual senators don’t even feel they have power to change the Senate’s own rules. With each party focused on the next vote, the next tactic or the next maneuver, it’s no wonder each side maintains such strong adherence to the apparently immovable filibuster rule. That’s become the case even though the rule entraps both parties in a cycle of hopeless inefficacy, a helpless discouragement that infects the rest of the government, and indeed the rest of the country. The media like to blame Republicans for this state of affairs, but neither party is responsible for the Senate’s inability to act. The Senate is responsible for that, and the Senate can change its own rules. It just proved that.